Worried that you may have to give up color in your landscape to save on maintenance and water? Afraid that watering restrictions in your area will put a damper on your colorful flowerbeds, borders and shrubs? It doesn’t have to be that way! Many brightly-colored trees, shrubs and flowers don’t require as much water once they become established, which generally takes about a year. The key is knowing which plants to select and how to treat them for that year. The key to keeping your color while losing the water is to opt for plants that aren’t quite so thirsty. Fortunately, there are all types of beautiful drought-tolerant plants to choose from, with more cultivars being developed every year. To be sure drought-tolerant, water-saving plants get the good start they need, it is important to plant them in appropriate locations. Some do well in full sun, others need varying amounts of shade. Also pay close attention to soil needs, including pH values – the chemical composition of the soil affects its water retention and the ability of plants to absorb that water effectively. If your plants are in the right spot, they will flourish with the best foliage and flowering possible, even with little watering. 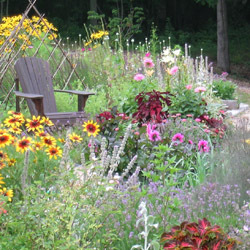 Plant drought-tolerant plants as early as possible so they can begin growing strong, absorbent roots well before the driest days of summer, and use drip watering systems, mulch and windbreaks to protect delicate plants from too much heat stress. Grouping plants with similar watering needs together can also help minimize water loss by avoiding irresponsible watering. Water in the very early morning when the air is still cool and less water will evaporate before it soaks into the soil. Water deeply but infrequently to help plants stretch their roots deeper into the soil seeking moisture. Check your irrigation system regularly for any leaks or other problems that could result in poor watering practices. With thoughtfulness and care, you can easily enjoy beautiful, colorful flowerbeds, gardens and landscaping even without a great deal of water.